Kofi Annan, l’ex segretario generale dell’Onu, è morto in Svizzera a 80 anni dopo una breve malattia. Diplomato nel 1957 al Collegio Metodista di Cape Coast, Premio Nobel per la Pace, nel 1998 è stato insignito anche del Methodist Peace Award per il suo impegno nel mantenere la pace tra i Paesi. The World Methodist Council (WMC) joined leaders from around the world to pay tribute to Kofi Annan, who died aged 80 after a brief illness. Kofi Annan was the first sub-Saharan African to lead the United Nations (1997-2006). His deep commitment to justice, human rights and championing the fight against HIV and AIDS earned him the Nobel Peace Prize. In 1998, the WMC recognized his contribution and honored him with the Methodist Peace Award. Former WMC President, Dr. Francis Alguire recalls Kofi Annan’s acceptance speech at the ceremony in the Chapel of the United Methodist Women across from the United Nation in New York. He related a story about a teacher in a Methodist School in Ghana who held up a piece of paper and reminded them that while they were small dots in a great big world, there were many opportunities for them. 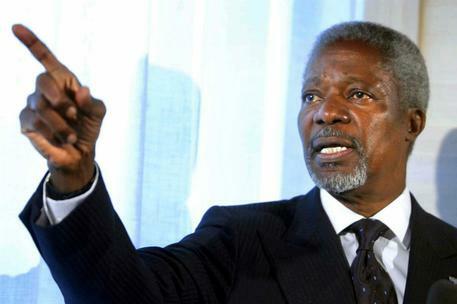 In 2012 Annan was appointed Chair of The Elders, a peace and advocacy group started by Nelson Mandela. Until the last, he was a tireless worker for peace. Last month, he attended an event to mark the 100th Birthday celebration of Nelson Mandela in Johannesburg and witness the first post Mugabe elections in Zimbabwe.